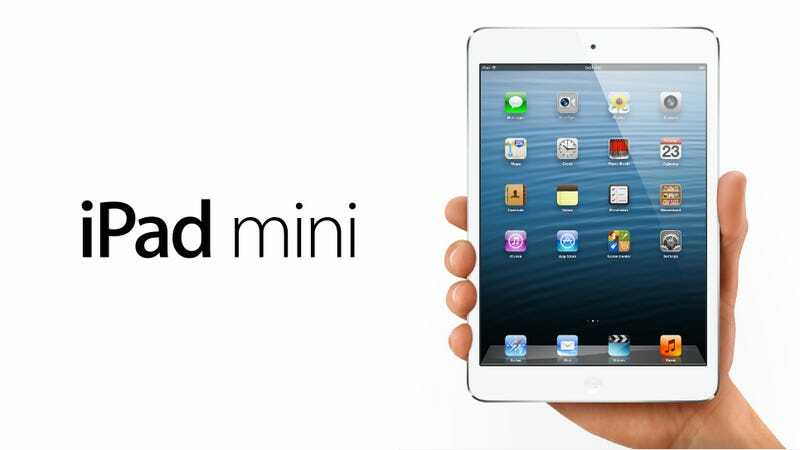 The iPad Mini is here. It's a sleek, thin and light 7.9-inch tablet made of anodized aluminum and glass that follows the format reduction pioneered by Google and Amazon. This thing is really neat. Really light and thin at 0.68 pounds and 7.2 millimeters. In a nutshell: it has better specs and it's thinner and lighter than the Amazon Kindle Fire HD and the Google Nexus 7, but much more expensive too. In fact, the iPad mini's screen has 35% more real estate than the Nexus 7, but the truth is that the latter has a higher resolution and more effective real estate than Apple's offering. According to Apple, that gives you a 50% larger surface to browse the web in portrait mode and 67% larger in landscape mode. It doesn't. It's yet to be seen if the the size difference will affect consumers decision. My guess is yes, if consumers think the price is competitive enough. Are all the features and the thinner, lighter and prettier design worth the price differential with the Kindle Fire HD? $130 is a lot of money. The pixel resolution is 1024 x 768 pixels. It's not as dense as the iPad 3 and 4, but at that size it will be much sharper than the previous generations. It's quite light and thin. It's comparable to a pad of paper, like Apple says: just 0.68 pounds and 7.2 millimeters thin. That's 53% lighter than the fourth-generation iPad. It compares very favorably to the Nexus 7 (0.75 pounds and 10.4 millimeters). Some models come with LTE connectivity, like the Kindle Fire HD 8.9-inch. But that's much more expensive. The comparable regular Fire HD and the Nexus 7 only have Wi-Fi. It naturally comes with 802.11a/b/g/n Wi-Fi and Bluetooth (like Amazon and Google's models). Basically, this is a reduced iPad 2. It uses the same dual-core A5 processor, and it probably comes with the same RAM as the old iPad: 512MB. Apple say it's basically the same (or better) guts but in a reduced package (an exception is the cameras and the Lightning port). Both the Fire HD and the Nexus 7 come with 1GB of RAM. We will have to wait to learn how much RAM it has, though. Perhaps this has been upgraded too. It has a FaceTime HD camera, which is better than the one in the iPad 2. It's comparable to the Nexus 7, which is 1.2 megapixels too. The iPad has a backside illuminated sensor and, like its older sibling, it supports Face detection. The Kindle Fire HD and the Nexus 7 don't have LTE support at any price point (if you want LTE on the Fire HD, you have to get the 8.9-inch model, which is the competition to the iPad 4 starting at $499 for the 32GB model). On the Wi-Fi front, however, both Android tablets have a much better price, specially the Fire HD, which is $199 for the 16GB model. The $199 Nexus 7 will only get you 8GB. You can start pre-order this Friday, October 26, and receive the Wi-Fi version on Friday next week, November 2. The cellular versions will come first to the US, two weeks after that date. They will come later to the rest of the world (no announcement yet). The iPad 2 remains at $399, by the way—the iPad 3 is gone, replaced by the 4th generation model at $499.